How to prove there is Iodine in Salt! So you don’t have to pause the video over and over let’s start with the recipe for the initial test. Start by putting 125 ml of water into each of your containers. It does not have to be deionized or distilled tap water will work fine. Next add two tablespoons of salt to one container and stir. Continue by adding two tablespoons of the salt labeled as iodized to the next container. Do not mix the salts and be sure to keep track of which container has iodized or non-iodized salt. If other salts are being tested add them to the water in a separate container. Mix each solution thoroughly, with the amount of water suggested the solution will likely become supersaturated and there will be some salt left over on the bottom. Still, you should mix well to encourage the ions within the salts to separate. Continue by adding one teaspoon of vinegar. A little more or a little less is okay. However, an an excessive amount of vinegar will interfere with the starch reaction later (the actual Iodine test) so don’t over do it. Mix the solutions again. At this point in the video I skip the addition of teh Hydrogen peroxide. It’s probable that it will work to simply add the starch at this point. But, the reaction will be darker and probably work better if you lower the acidity by adding in the Hydrogen peroxide. Again about a teaspoon of the hydrogen peroxide should be used. Finally you should mix a bit more before adding the starch to the solution. As I mention in the video the recipe I had just said a “scoop”, in fact it takes very little corn starch to show the color change. I also found that the reaction required a bit of mixing, so you should mix once again if you aren’t already. Alternately instead of adding the starch to the mixture you could drop the solution onto the starch, but as shown the effect is minimal and nowhere near as dramatic as simply adding the starch directly. Congratulations! If you did everything right you should have seen a beautiful color change. This in itself demonstrates which salt sample does or does not have iodine. If you want to go for the bonus step you can get out the vitamin C.
If you don’t have powdered vitamin C you ought to crush it up now. Next add about a teaspoon to the mixture that changed color. In this new reaction the Vitamin C is the limiting agent so if you don’t add enough the color won’t reverse so err on too much. Again the color change requires mixing. It is impossible to reverse the color completely but a great deal of the dark color should lighten. The Chemistry: Okay that experiment is all well and good but what is actually going chemically. The iodine that is added to table salt is usually in the form of Potassium Iodide. This is an ionic compound where the potassium gives up it’s extra valence electron to the iodine so the iodine can have a nice set of 8 valence electrons. Then the compound is held together, like most salts, by the difference in charge. Now when we dissolve the salt into water the polarity of the water molecules separates the potassium from the iodine, but the iodine holds on to it’s extra electron, hence it’s called an Iodide ion. In the background of this reaction the sodium and chloride of the rest of the salt is also separating out and any anti-caking agents are also floating around but I chose to ignore these as they are just spectators and don’t participate in the chemistry we’re interested in. The next step in the reactions is to add in hydrogen ions. 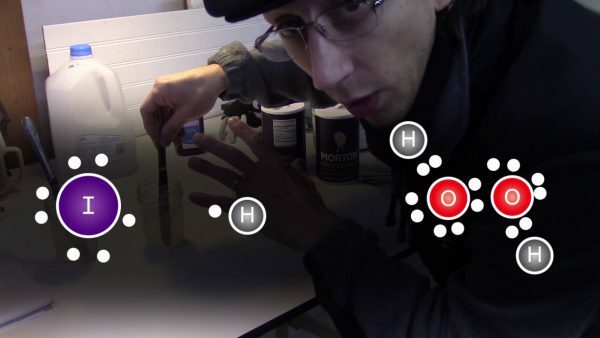 Now I didn’t mention this in the video but free hydrogen ions are the measure of acidity or pH. In this case what happens is the hydrogen in the acetic acid (HC2H3O2 ) disassociates and floats off on it’s own. Now with that background taken care of and ignoring all the huge excess of spectator ions we actually get the chemical equation I talked about in the video. So first add acid to have the hydrogen steal the electrons off the iodine, then add Hydrogen peroxide to clean up the neutralized hydrogen. This then allows the iodine to bind back to itself to form pure iodine molecules. The reason for this game is to get the iodine into an uncharged state so that it can insert itself into the amylose starch ring. Here the starch forms a helical ring around the iodine and the consequent rearrangement of the electrons leads to a color change. Now the reverse process – while it also has a lot of spectator ions – is relatively straight forward. Basically the addition of the Vitamin C (Niacin) breaks up the molecular iodine leaving the charged iodine ions. Because of the charge on the iodine ions the the starch can no longer wrap around the iodine and the structure unravels. This turns the solution back to a whitish tone. Lastly while I attempted to try this as an indicator solution it seems that the low concentration of iodine within the salt meant that there wasn’t enough surface interaction to show the starch binding strongly. Like I said, it would definitely be easier to buy Iodine solution, if possibly less illuminating. Mistakes: Boy I made a lot of mistakes on this one – fortunately most of them were about my lab skills rather than the information. Obviously I wasn’t being very careful here are just a few issues with how I did things. I’m sure there are many more (yes please comment and tell me). Fortunately I was working with relatively harmless materials with a lot of water diluting everything. I think that not cleaning the teaspoon between tests was the most scientifically impactful issue. On the other hand safety was right out the window – so if you do try this one please use proper chemistry safety and don’t emulate my mistakes. Previous How to fold and photograph a snowflake – and why do they have 6 sides?